The Pink Bow Project by Karen Hawkins is an installation at Gallery Shoal Creek in Austin, TX from April 13th to May 12th, 2018. Fifty two panels each with 1000 bows to approximately represent the substantiated cases of sexual abuse of females under the age of 18 each year in the US. Karen created the project to open up more conversations about sexual abuse, to help educate people, to create the opportunity for healing, and bear witness to those who are the victims of that abuse. Scattered on the floor of Austin artist Karen Hawkins' studio, are thousands of pink hair bows. These ubiquitous symbols of a girl's childhood and innocence have become the embodiment of Ms. Hawkins' artistic vision over the last few weeks. As awareness and willingness to see the extent of sexual abuse becomes a national discussion, Ms. Hawkins felt the time was right for this monumental art installation. these forms, their printed meaning yields to a purely visual experience. With her latest work, Hawkins is flipping the script — she wants stories to be told, and hers is one of them. “My name is Karen, I was 10 years old.” It’s not quite comparable to the volumes of description contained within her past work, and yet we already know everything we need to. Hawkins spares us the details, because she knows that her experience isn’t important on account of how it stands out — it’s important because it doesn’t. For the past year, artist Karen Hawkins has excavated a dark aspect of humanity, reaching in to reclaim a measure of power over the memories left behind. 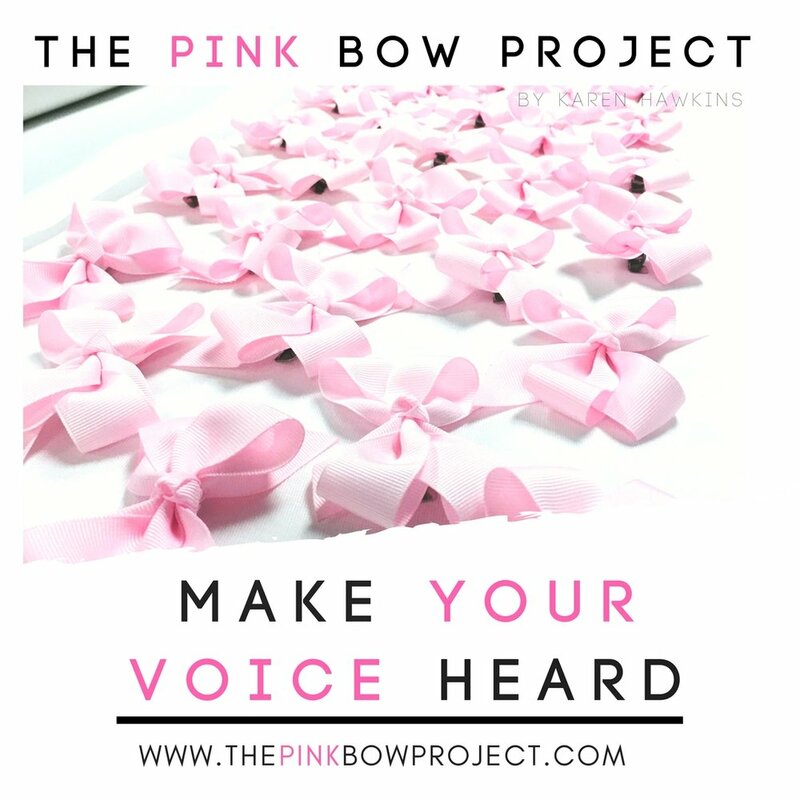 The Pink Bow Project, which will be on view during National Child Abuse Prevention Month, opens with a Private Preview on April 12th at Gallery Shoal Creek in Austin, Texas. A large-scale, multimedia work, The Pink Bow Project, is designed to envelop its audience. Upon entering the gallery, you are confronted by 52 sheer panels hung from the gallery ceiling like curtains. Massive in scale, each 9’ x 4’ panel holds 1000 pink hair bows, a ubiquitous symbol of a girl’s childhood innocence. 51,660 hair bows will be displayed, representing the number of substantiated sexual abuse cases against young girls reported annually to national Child Protection Services agencies. Find the full article below, pages 76-77. My tiny treasures made their way onto the cover of Belle Magazine's February/March 2016 edition. Thank you Fern Santini. Wishing a Happy Holiday and wonderful New Year to all. Be sure to stop by Shoal Creek Gallery this holiday season to see Karen Hawkins's Tiny Book Forms and many other small treasures. Support local Austin artists and give the gift of art. Visit www.galleryshoalcreek.com for more information. Drawn to the structure of books, Karen Hawkins asks, “How many ways can I objectify books?” in an engaging video about her work. At the 5 DECADES opening, the Austin-based artist talked with Natalie and Paul Bardgjy about “Jelly Melts” (left) and “Once Upon a Time” (right). These works, featuring whimsical clusters of rolled book pages, appeal both nostalgically and visually. Suspended Fiction presented by Laura Rathe Fine Art features the conceptual works of installation artists, Tara Conley and Karen Hawkins. By incorporating script and literature in various media including bronze, metal and paper, this Texas contemporary artist duo creates pieces that explore the depth and meanings behind the echoes of society's voices. "Karen uses dictionaries, sheet music books and black and white picture books, from what I could see, to construct her sculptured, hanging pillars. In addition to the pillars, there were several small pillars sitting on tables in the gallery. There were two wall pieces, one of which was incredibly striking." Aether is a semi-annual e-magazine that aims to engage collectors, artists, and galleries in conversation about the visual arts in our community and beyond. Read more about Karen Hawkins in article by Judith Taylor. After a visit to the Texas Contemporary Art Fair in Houston this October, Karen Hawkins partnered with LRFA gallery and will be opening her first solo show on December 6, 2014.